Many people can interview well, but this doesn’t necessarily mean that they can execute. If a person comes across as dynamic and charming in a first interview, you may want to consider offering them a series of tests in the second round to ensure that they can back up their charisma with real skills. Depending on the type of product your company sells, have them put together a mock presentation for a client and then deliver this presentation to you. This helps you to get a sense of how they would do should they be offered the role. Turnover rates in sales can be high, due to the demanding nature of the job (not to mention the fact that salespeople often have to deal with constant rejection). If you’re always scrambling to fill holes on your team, you may find that you make unwise hiring decisions out of haste. To prevent this from happening, you should constantly have an awareness of great talent in your industry, and should have good working relationships with these individuals. This way, if an immediate need becomes available, you can start having a conversation with one of these people instead of having to take whoever submits a resume and hoping for the best. You can teach facts about your industry and about your product. However, you can’t teach enthusiasm and focus; remember that as you’re hiring. It’s easy to get swept away by someone’s experience, but it’s much smarter to hire someone who’s eager to learn than it is to hire someone who’s burnt out but experienced. 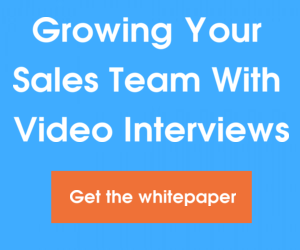 What do you look for in potential sales team members? Let us know in the comments!